Monsignor Cuttitta in his homily during a concelebration in the Cathedral: "Humanity has no color, because we are all children of the same Father, because we can not profess ourselves Christians and then assume behaviors that deny the Gospel"
"As Bishop of Ragusa, what happened in Neonatology leads me to apologize because to act were Ragusani, certainly baptized that maybe profess themselves Christians. And so it is also up to the bishop to apologize because humanity has no color, because we are all children of the same Father, because we can not profess Christians and then assume behaviors that deny the Gospel ". This is what Monsignor Carmelo Cuttitta said ending the homily of the solemn concelebration in the cathedral on the occasion of the third anniversary of his entry into the Diocese, on the episode of intolerance in hospital against an Eritrean migrant who had gone to visit the 15-day-old son in neonatology. "We live in a climate of growing intolerance - he added - also fueled by a policy that aims to divide, to create alarms and generates fear and on this fear and on language and unscrupulous attitudes based its ability to increase the consensus. What happened is a child of this climate that wants to deny values ​​such as acceptance and solidarity and wants to deprive a rightful part of humanity of the right to the future and to hope ". "This woman, the mother of a newborn baby, had approached - the bishop recalled - and was dismissed in a bad way. We can not remain inert when the lives of others and the discomforts of others go away. Here, dear brothers and sisters, we look around us, discover all that there is to discover and move and work because - concluded Monsignor Cuttitta - in this world we are all brothers and sisters and we all come from the same God ». "Yesterday at the UTIN - Neonatal Intensive Care Unit -" MP Arezzo "hospital there was an incident that affected the Ragusan community, always welcoming towards immigrants, for the manifestation of intolerance towards the young mother Eritrea landed Sunday night in Pozzallo ". Thus began the note with which the ASP of Ragusa officially takes position on the story that has seen protagonist, in spite of himself, Fara, a 19 year old Eritrea landed in Pozzallo in the night between Saturday and Sunday and who had gone to the hospital Maria Paternò Arezzo of Ibla to ask for help for her baby, a baby girl of a few days. "It had arrived destroyed by the journey - explains the ASP - in conditions of extreme fragility, with her baby in her arms. Victim of violence, suffered in Libya, like many other women in the same conditions, she loved that child, from the first moment ". In Ibla, Fara had been accompanied with the permission of the health director of the hot spot of Pozzallo, dr. Carmelo Lauretta . But here was the unthinkable, with a group of women who began to rail against her, going so far as to ask that she be removed. "We were afraid it was infectious" they would have declared these people to justify themselves, and to trigger such a reaction would have been the sterile overalls, gloves and hat that the woman, for purely precautionary purposes, apparently wore on arrival at the hospital. It was not easy to sedate souls, and when the calm is back, thanks to the intervention of law enforcement, dr. Giuseppe Cappello of the Health Department of the Hospitals of Ragusa has identified a room in the Department of Obstetrics and Gynecology of the hospital "Maria Paternò Arezzo", made available by dr. Giuseppe Bonanno , director of the UOC, which will allow the young mother to stay with her daughter in this delicate phase of hospitalization. The mayor of Pozzallo , Roberto Ammatuna, met the woman at the hotspot and spoke of an "intolerable episode" against a very young mother who also suffered violence. We must not forget that when we talk about migrants, we are talking about people, human beings and not parcels. Our city - it has concluded - has always been hospitable and welcoming and this episode, even if verified in Ragusa, is affected by the climate of intolerance that for some time has been recorded against the immigrant ". "The unmotivated fear that has been unleashed around a young migrant - declared, instead, the mayor of Ragusa, Peppe Cassì - can not leave us indifferent. We have prepared immediate investigations on what has happened but, beyond the checks, remains an image of a city that does not belong to us: Ragusa is a tolerant and inclusive city, with a history of emigration and an immigration and welcoming present. 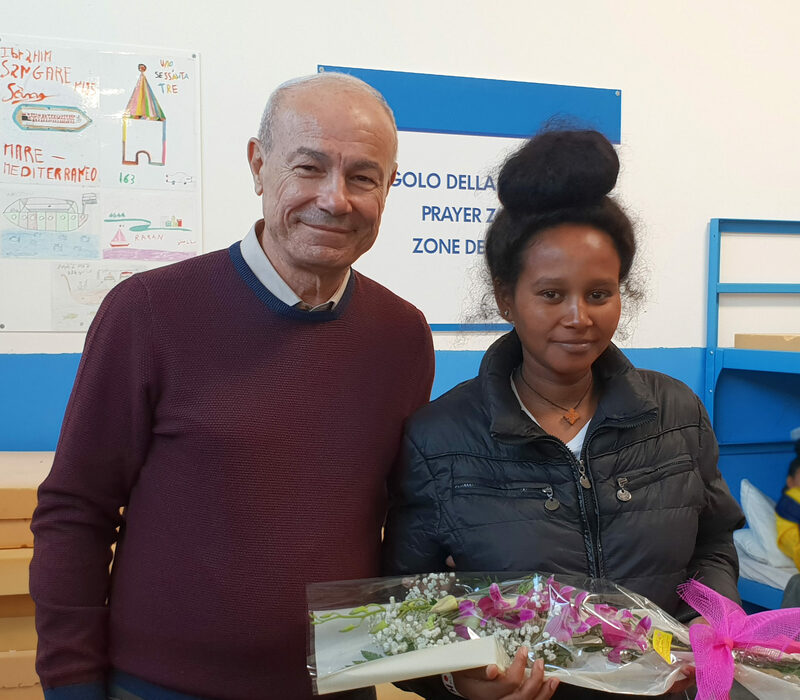 My closeness and of our whole community goes to the young mother Eritrean victim of the episode: I am sure that Ragusa will show her that she is very different from how she appeared today ". And indeed, already in these hours it is proving very different. In fact, a real solidarity race has taken place when the story of Fara has become known and many people are making, or making available , clothes, baby bottles and diapers. The story of Fara has quickly made the tour of Italy and even Emma Bonino , on Facebook, condemned the racist gesture: " Faced with all this - he wrote - we can not but feel the obligation to react and try to stop this 'wave of hatred and xenophobia that is pervading our country, beginning to denounce publicly every episode, more or less serious, of which we have news.